The exploit is very simple. Basically, a step-back – performed by moving the right stick down – will provide a boost to shooting. That isn’t an unrealistic concept of course, given that it’s a move that’s intended to create space between the ballhandler and the defender for a more open look. However, it’s too generous of a boost, to the point where if you’re playing on one of the easier difficulty levels, it can be used to knock down three-pointers with players who shouldn’t be hitting them, such as Shaquille O’Neal and Dikembe Mutombo. It also means that it pays to perform a step-back to well beyond 25 feet from the basket, even if you’re already open at the arc. With a great shooter, it’s easy to take advantage of NBA Live 2003’s quick pace and put up some truly ridiculous numbers. In fact, a fun challenge is to fire up the game, pick a team with a top three-point marksman, lower the difficulty to Rookie, and see just how crazy things can get. On twelve minute quarters, you should be able to get at least one player to top the 100 point mark, and likely easily clear the 200 point mark as a team. 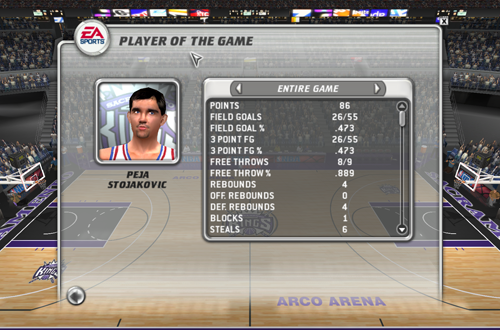 Peja Stojakovic and the Sacramento Kings are a good option, as the above screenshot demonstrates. It’s not one of my best efforts as I was taking some rushed shots, but the step-back exploit was still put to good use on a lot of the makes. It’s an exploit that stands as a good example of how gameplay features can sometimes be problematic and unbalanced when they’re new. As noted, a step-back is an elusive move that allows a player to have a more open look at the basket, and advantageous in that it can be used to square up to the basket and set your feet. It was the right idea to make it an effective tactic, but as with most of the new Freestyle moves, it wasn’t properly balanced. The step-back exploit didn’t guarantee a basket, but much like the Acrobat glitch in NBA 2K13, it was a cheap way to make three-point shooting a lot easier, disregarding realistic shooting percentages (and even abilities). There are several reasons why new gameplay mechanics experience some teething problems that result in exploits such as this one. New tech may still have room for improvement, lacking polish but still being functional enough to implement. There’s oversight, as well as the possibility that a final tuning tweak turns out to be a bad idea. 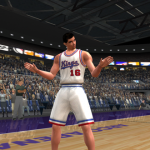 In NBA Live 2003’s case, it was most likely the philosophy behind the gameplay. EA was aiming for a fun atmosphere, with a focus on scoring and pulling off crossovers and other moves with the new right stick controls. This approach not only resulted in the gameplay being unbalanced, but also accounts for the infamous cutscenes. On top of the boost gained with the step-back move, the speed of the animation was a factor in its cheesiness. 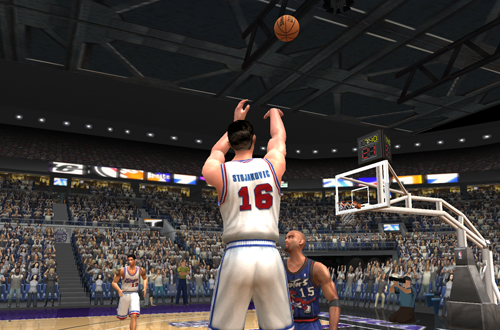 With NBA Live 2003 aiming for an up-tempo, offensive-oriented style of gameplay, Freestyle moves were quick animations that were difficult for the defense to react to, and properly counter. Step-backs were very quick hops backwards, which could easily transition into an immediate jumpshot for users who were quick on the trigger. Its effectiveness in boosting your chances of hitting long threes could also be exploited. This was long before Stephen Curry made really long bombs fashionable, so AI defenders often didn’t crowd shooters that far out. Speaking of the AI, this particular exploit is notable for being one that the CPU would actually take advantage of. A lot of exploits like this tend to be user-only strategies, since the CPU has its own methods for tipping the balance in its favour. Additionally, in many older games, the AI often wouldn’t be smart enough to take advantage of advanced moves or even basic strategies, let alone cheesy tricks. The AI in NBA Live 2003 seemed to be aware of the step-back exploit though, as I recall it being used against me on more than a few occasions. Indeed, it was known to step-back with the aforementioned Shaq and Mutombo, and knock down threes to beat the shot clock. Fortunately, NBA Live 2004 set the series back on the right path in terms of realism, toning down Freestyle moves and providing us with gameplay sliders to tailor the experience to our liking. It had its own cheesy strategies though, and to this day, it’s a tall order for basketball video games to be entirely free of cheddar. They’ve definitely improved though, and it’s interesting to take a look back at how far they’ve come. Of course, it’s also fun to look back at the old tricks and exploits in the titles we grew up with. Like corner threes in Double Dribble, the step-back exploit in NBA Live 2003 wasn’t exactly sim, but it helped us to find success on the virtual hardwood. Spinning to the hoop was also very effective in NBA Live 2003. Very much a shootout in that game.